Hardly anyone likes gold today. In the closing days of November, the Daily Sentiment Index (trade-futures.com) registered a ten-day average of just 9.1% gold bulls. That was only the third time in the sentiment gauge's 30-year history that such a low bullish reading was recorded. But, as we've shown on these pages again and again, financial markets often have a way of turning up just when pessimism becomes the most extreme. Indeed, this happened with gold a year ago. Last December, large speculators such as hedge funds were so unenthusiastic about gold's bullish prospects that they held their smallest net-long position in 12½ years. 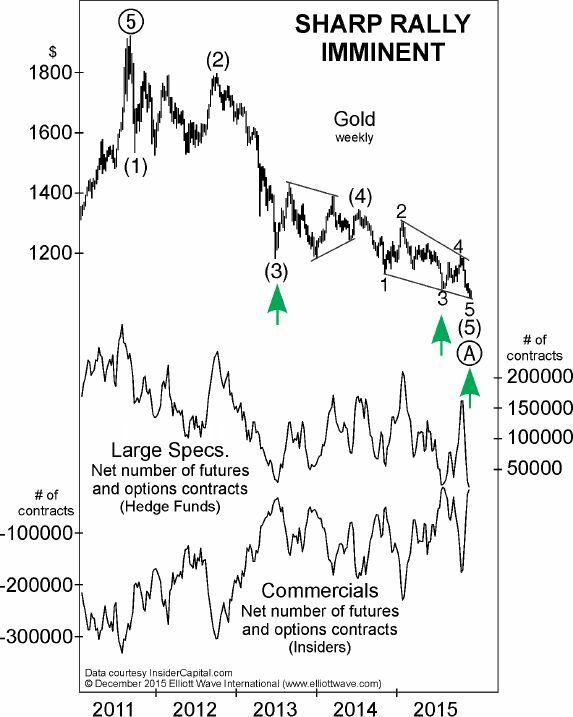 Gold prices are in the late stages of an ending diagonal, which, when complete, will finish a five-wave decline from the September 2011 peak at $1921.50. ... Over the past week pessimism has grown more intense, which is consistent with an impending rally, the same message conveyed by the completion of a diagonal pattern. That forecast was published within hours of gold's Dec. 3, 2015 low of $1046.20! In July, the price of the yellow metal rose to $1375.53, a 31% rally. That's a perfect example of hindsight being 20/20. When gold was approaching a bottom last December, no one saw the upcoming Brexit vote or other fundamentals as bullish factors. After the rally, the reason for it appeared "obvious." This is why basing investment decisions on such "fundamentals" often results in disappointment. [The current wave up] has now satisfied its minimum expectations. From the July high through Dec. 1, gold's price declined 15%. The Wave Principle is not a crystal ball. Yet, when you watch price patterns and sentiment extremes -- the true leading trend indicators -- you can often spot gold's key junctures well before other investors read about it in the news. In fact, we believe gold may be at such a juncture right now. Learn how to apply the Elliott Wave Principle to your favorite markets. In this free 15-minute video, EWI Senior Analyst Jeffrey Kennedy explains how to take the Wave Principle and turn it into a trading methodology. You'll learn the best waves to trade, where to set your protective stop, how to determine target levels, and more. This article was syndicated by Elliott Wave International and was originally published under the headline How to Get a Firm Handle on Gold's Ups and Downs. EWI is the world's largest market forecasting firm. Its staff of full-time analysts led by Chartered Market Technician Robert Prechter provides 24-hour-a-day market analysis to institutional and private investors around the world.